The Finelia solution software, available in several languages, is scalable, and can be deployed to several sites, anywhere in the world. Your financial management will benefit from personalised reports and a more rapid overall consolidation of Trade Finance operations within your group. Simple to use and easy to implement, Finelia can be installed on your company’s Internet server, as well as being available in hosted mode (SaaS Service Offer), thus can be adapted to suit your company’s technology requirements. The multi bank architecture allows you a consolidated overview of all documentary credit and international guarantees, within a multi company and multi site context. Automated sending and receiving of banking messages. Whatever the form of message (email, fax, post), the system will process all of your operations. Finelia software manages all of the SWIFT Trade Finance messages exchanged between banks and companies. 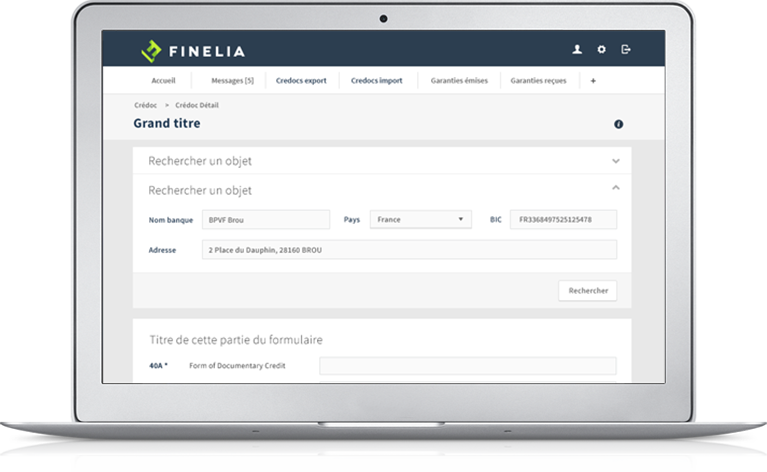 Finelia offers a shared overview within the same service, business unit or group, which leads to a more streamlined and efficient flow of information. Multi bank solution for the processing and monitoring of export documentary credit, which reduces DSO, improves cash flow and reduces the number of discrepancies. Multi bank solution for the processing and monitoring of import documentary credit, which optimises the management of lines of credit and improves the visibility of your operations. Multi bank solution for the management of international guarantees, which optimises liability monitoring and improves the visibility of your operations.